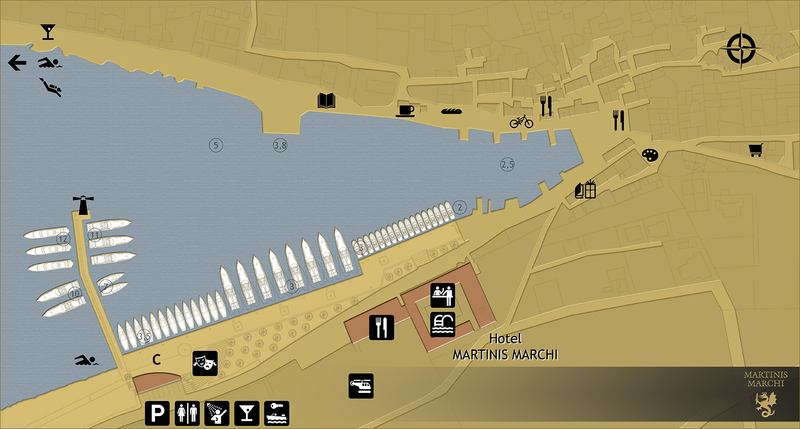 A new marina has been built near the luxurious Martinis Marchi Heritage Hotel & Restaurant. Inside there are 50 berths covered with marble, equipped with moorings, electricity and water. New waterfront offers a safe place for yachts measuring up to 35m, and even longer on the outer side of the breakwater. An amphitheatre with 500 seats is built in the style of ancient Greek theatres. Marinis Marchi Marina is the first place winner of Best Small Marina in Croatia for 2018 and second place winner of International Cemex Builder Award for the Best Infrastructure and Urbanism 2012. Marina Martinis Marchi with its luxurius amenities answer to the growing demands for yacht berths in Mediterranean. The offer of long term lease will bring you solid long term capital investment and potential income true berth managment that helps owners to get a return of his assets. We welcome 10 high profile yacht owners who like privacy and exlusivity of the marina Martinis Marchi. Each individually will be approached with extreme attention and with special arrangements at Martinis Marchi hotel and restaurant.